Who said lasagna has to lie flat? Not only is this a creative way to enjoy your lasagna- it helps with portion control. This tasty pasta dish is filled with delicious, traditional Italian ingredients including flavorful herbs and spices. Make the Lasagna Rolls ahead of time and keep them in the freezer for a healthy recipe that pleases the whole family. NOTE: We like to prepare a fresh sauce for this recipe. Though, using an Organic ready made sauce will be ok. 🙂 If you have extra sauce, the sauce can be stored in the freezer. Chop and place tomatoes and garlic in the blender. Blend until desired consistency. Finely chop onions, mushrooms, basil, and set aside. In a large pan, place 2 tablespoons of olive oil. Turn pan on to Med-High heat. Add to pan the chopped garlic, onions, basil, thyme, oregano, and 1 tablespoon of sea salt. Sauté until tender. Add the blended tomatoes, garlic and tomato sauce to the pan. Stir all ingredients. Bring to boil then turn the flame to low. Let simmer. (desired time is 45 min-1 hour to allow flavors to set in). While the sauce is simmering. Season the ground turkey with sea salt and fresh ground black pepper. Place the ground turkey in pan and cook until done. Strain if needed and place in the simmering tomato sauce. Grab a large pot fill half way with water. Pour in 2 tablespoons of olive oil and 2 pinches of sea salt. Boil water on high. 10. Bring water to boil, add lasagna noodles and cook according to lasagna directions. 11. Turn sauce off if it’s still simmering at this point. 12. Turn on oven. Preheat at 375 degrees. 13. Once noodles are done, pour into drainer & run cool water over them. 14. Line a large baking pan with parchment paper. 15. Take one lasagna sheet and place on parchment paper. 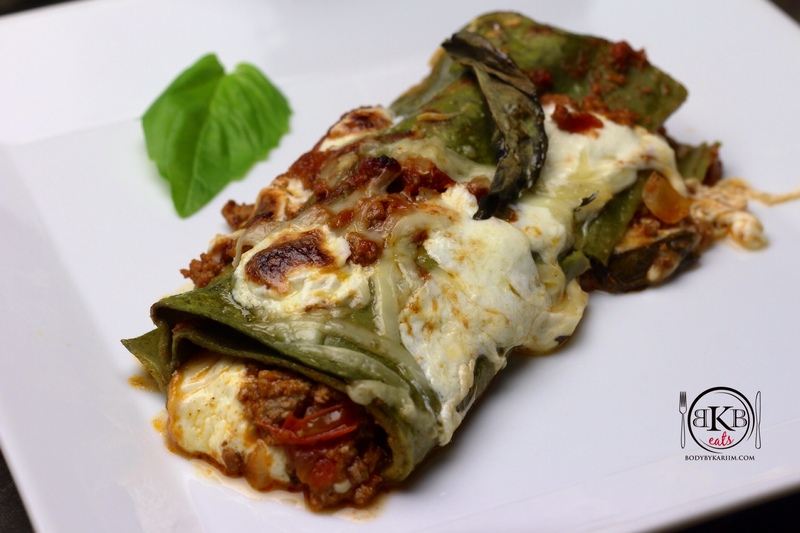 Fill with 2 tablespoons of meat sauce, 1-teaspoon cottage cheese, fresh mozzarella (to your liking). Begin to fold until a roll forms. Repeat this until you fill the pan with lasagna rolls. 16. Top lasagna rolls with additional sauce then with fresh parmesan and (add fresh basil leaves if desired). 17. Place in oven and bake uncovered for 20-25 minutes or until cheese has noticeably melted. 18. If you like the top to be a little crisp, place the oven on broil and brown to your liking. 19. Allow to cool & Enjoy!